Voters line up to cast ballots at the LBJ Student Center at Texas State University on Nov. 2. As the dust continues to settle after last week’s election, Hays County has been left to grapple with a bit of a political identity crisis: Is it red or blue? The rapidly growing Central Texas suburban county — Texas' 22nd-largest by registered voters – hadn’t voted for a Democrat at the top of the ticket since 1992. In this year's general election, however, it gave U.S. Rep. Beto O’Rourke, D-El Paso, a 15-point edge over Republican incumbent U.S. Sen. Ted Cruz. 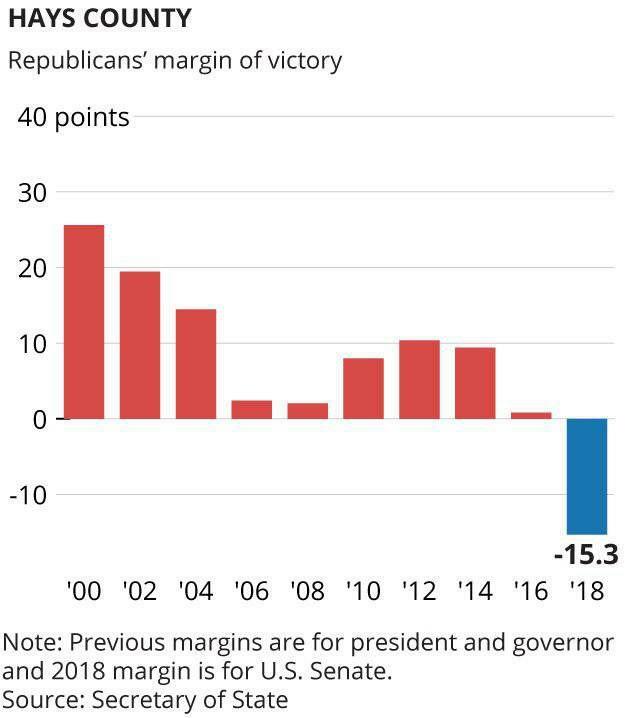 It was the first time in 13 general elections that the county flipped, even though it has been becoming increasingly blue in recent elections. Turnout was so large during early voting that students reported waiting in lines for more than an hour. After the Texas Civil Rights Project threatened to sue the county amid allegations that the county was suppressing the college student vote, Hays County commissioners extended early voting on the university’s campus and added an Election Day voting site. And it appears from Hays County election data that Texas State students took advantage of the extended voting opportunities. The 334th precinct, which includes the on-campus LBJ Student Center voting location, saw the largest increase in voters from 2014 to 2018 of any precinct in Hays County. A total of 1,942 voters cast their ballots this election, with 75 percent voting early. That’s more than five times the 373 voters who cast their ballots in the 334th precinct in 2014, when 80 percent voted early, and significantly higher than the 1,406 voters who cast their ballots in that precinct in 2016, a presidential year, when 61 percent voted early. Overall, 80,229 people cast their ballots in Hays County in 2018, doubling the turnout since the last midterm in 2014. But increases were not uniform across the county’s 49 precincts. The biggest change was in student-heavy areas of San Marcos where some precincts saw three to five times the number of voters. Democrat Beto O’Rourke saw his largest margins of victory in these precincts in and around Texas State University. “A lot of the voter turnout had to do with the university,” said Jennifer Anderson, the Hays County elections administrator, but she cautioned against reading too much into Texas State turnout because there were large increases in voter turnout throughout the county. Rottinghaus said that because counties do not typically make it easy for students to vote, students tend not to vote and, because students don’t vote in large numbers, counties don’t put voting locations on campus. It’s a “self-reinforcing cycle,” he said. But the situation at Texas State this election was different, he said. “If you make it easier for college students to vote, they will vote,” Rottinghaus said. Keely Freund, a Texas State senior and student government officer, said she saw "Beto" plastered everywhere on campus – on T-shirts, water bottles, laptops and pins – in the months leading up to the election. She said that she was “not surprised at all” that O’Rourke won in Hays County because he visited there multiple times. Adrian Cooper, a Texas State senior, also said he was not surprised about O'Rourke's win in Hays County. Though he voted for Cruz, he said O'Rourke ran a “very effective campaign” on campus. He chalks up the switch, in part, to poor performances by statewide Republican candidates. Rottinghaus attributed some of the flip to the “Beto effect,” which he said persuaded more Democrats across the county to vote. For the first time in a general election since 2008, more Democrats than Republicans voted straight party in Hays County, election returns show, though the straight party voting option will no longer be available beginning in 2020. But he also said there are deeper changes that may have caused the county to flip: an increase in the number of older, progressive retirees who have settled into Hays County from Houston and Austin and more suburban women supporting Democratic candidates at the top of the ticket this election than in 2016. He said these changes could carry through to future elections.